Provision CARES Proton Therapy Nashville announces the opening of a new advanced proton therapy center and comprehensive cancer center in Franklin, TN. Provision CARES Proton Therapy Nashville is the newest development in the expansion of the Provision CARES Cancer Network, featuring proton therapy. The Center utilizes the ProNova Solutions SC360 Proton Therapy System, establishing a new Standard of Excellence by providing the most advanced technology in the only proton therapy center in the region. Proton therapy precisely targets tumors thus reducing the risk of side effects and providing improved outcomes and quality of life for patients both during and after treatment. 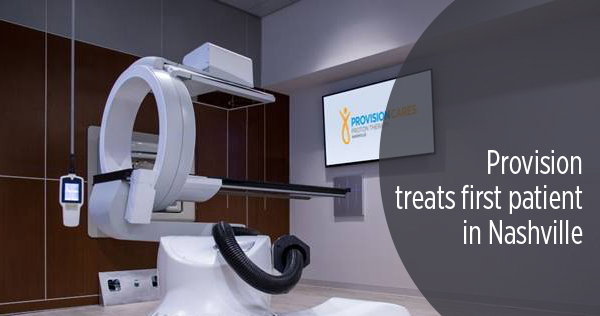 Provision CARES Proton Therapy utilizes the most advanced form of proton therapy, Pencil Beam Scanning (PBS). With PBS, oncologists can treat a tumor by controlling the proton beam to a precisely configured tumor target and by adjusting the intensity of the beam to achieve the appropriate dose, then stop the beam as it exits the tumor, limiting collateral damage. As a result, surrounding vital organs and healthy tissue are better protected from unnecessary radiation. James Gray, MD, Medical Director of Provision CARES Proton Therapy Nashville, has dedicated 25 years to serving cancer patients in Middle Tennessee as a Radiation Oncologist. “It’s a privilege to work with our local medical community and deliver the most advanced treatment in the world to cancer patients in Middle Tennessee” said James Gray, MD, Medical Director of Provision CARES Proton Therapy Nashville. Provision CARES Proton Therapy Nashville located in Franklin, Tennessee is serving cancer patients in Middle Tennessee utilizing the ProNova SC360 proton therapy system. As part of the Provision CARES Cancer Network, with the first center being in Knoxville, Tennessee, Provision continues to bring advanced cancer care to patients around the world. ProNova was founded by former leaders of CTI Molecular Imaging, which brought positron emission tomography (PET) technology out of the laboratory and made it a clinical reality for millions of cancer patients. Today the same team is redefining cancer treatment once again with the introduction of the first and only superconducting 360-degree compact proton therapy system, making proton therapy a clinical reality. It is the only proton therapy system developed in a clinical setting, benefitting from continuous input from physicians, medical physicists, and therapists during the entire course of design and development. The system includes state-of-the-art features such as pencil beam scanning and advanced imaging with cone-beam CT, all in a compact design.